10 out of 10 for originality: Did you follow London Fashion Week 17? Let me tell you, it was all about "Streetwear". 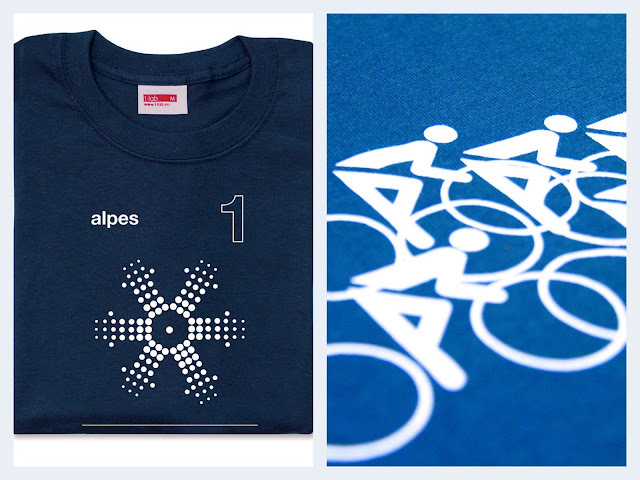 The humble T-shirts which we see as a commodity is definitely back in fashion. Tucked in with a smart jacket over for men, loose on cropped trousers for ladies. But finding a company which offers a variety of design to cover a wide range of tastes is not obvious. So here is my tip, have a look at T-lab. Their bold shapes and colours denote of a "less-can-be-more" attitude worthy of a catwalk without the three figures price tag. The updated palette is extensive. It comprises 184 shades: 170 individual colours 14 of which are repeated in varying strengths as ‘Colour Scales’. The colour tabs can be lifted to allow material matching. That is very clever. These archive colours sit harmoniously alongside contemporary shades conceived to meet the requirements of 21st-century living. 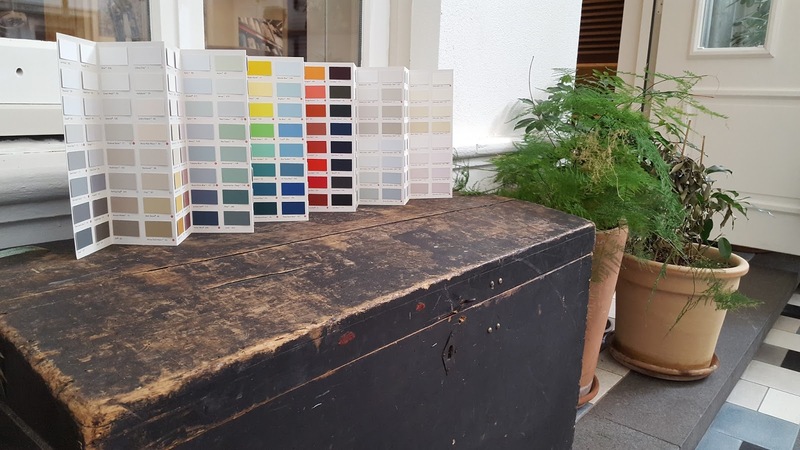 Watch this space, as Pebble Soup will soon be working more with Little Greene, taking part in a re-decoration project. Have you entered Heinz Good Sauces Giveaway No? Let me try to convince you to do so. If you have tried to do a pepper sauce in the past, you'll know that it's not straight forward so most of us do it on special occasions only. I am not going to pretend that Heinz has bottled up the secret of difficult sauces but their new collection offers good alternative for when you fancy that little bit of luxury but can't be bothered with all the faffing. Say for example you are craving for a steak sandwich, Here is a 20 minutes recipe. Heat 1 tbsp of the oil and the butter in a large frying pan over a medium heat. Add the onions and garlic and cook, stirring, for about 10 mins, until golden and beginning to caramelise. Remove from the pan with a slotted spoon and set aside. Add the rest of the oil to the pan, and turn up the heat. Season the steaks and cook for 2-3 mins per side, or until done to your liking. Remove from the pan and leave to rest for 4-5 minutes before slicing. Arrange the rocket over the halved baguette, then top with the onions followed by the steak. 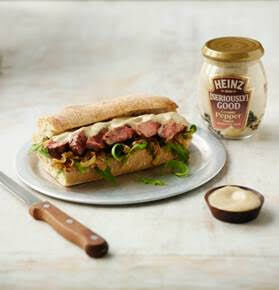 Spoon on the Heinz [Seriously] Good Creamy Pepper Sauce and sandwich together. Serve immediately. Talking about quality shop bought healthy food reminds me that I have neglected to bring to your attention two products which have their own Spring/Summer Collections and delighted me when I tried them. 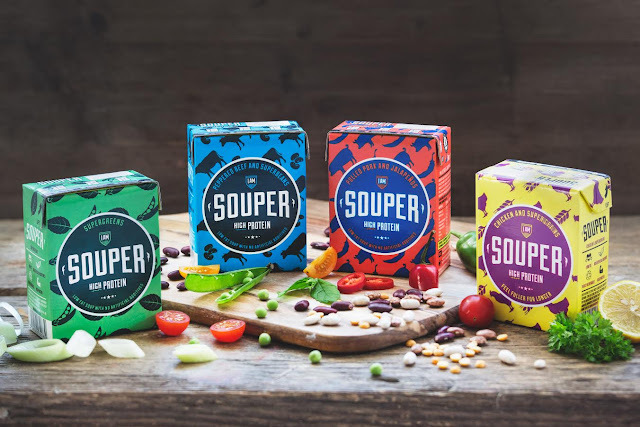 I am Super Food has a new range of tasty grains meals which are far from being boring. When I have been seating at my desk for hours with just the occasional break, sometimes I fancy something nutritious and tasty but easy like opening a tin. Trusty Pukka Pies recently launched its delicious new recipe for the nation’s favourite All-Steak Pie – and this month it won a Bronze Award at the prestigious 2017 British Pie Awards. The recipe renovation includes high-quality, tender and chunky cuts of beef in a richer, darker, oozier gravy - all encased in new and improved golden pastry consisting of over 100 light and flaky layers. 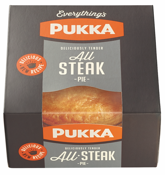 Pukka Pies are available at retailers nationwide including Tesco, Asda, Morrisons, Sainsbury’s and Co-Op from £1.69. Disclaimer: All the products in this post were sent to us for review purposes. We were not financially compensated for this post. All opinion expressed are our own and we retained full editorial control. Ancestry DNA : who did I think I was?